Nationalise the beleaguered RBS? Or Let them fail, you decide… Its your money! Vince Cable wants to nationalise RBS. You can see his logic. The taxpayer owns 82% of the firm already. Nationalisation is hardly such a radical idea; it’s more the logical completion of a process. It’s true that full nationalisation was never the advertised outcome. We were promised that these part-nationalised banks would be rapidly strengthened and restored to full private ownership.There were even muttered suggestions that the government could end up making a profit on its stake. But it would be daft to make policy on the basis on what bankers and governments choose to tell us. In 2007, the US Treasury Secretary, Hank Paulson, told the world that he didn’t see the subprime mortgage market as ‘imposing a serious problem. I think it’s going to it’s going to be largely contained.’ Sure, Hank. We know how that prediction worked out. 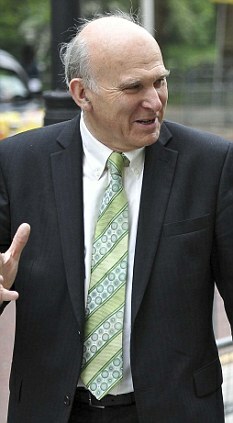 That same year, the head of financial insurance giant AIG’s financial products division said ‘it is hard for us, without being flippant, to even see a scenario within any kind of realm of reason that would see us losing one dollar in any of these [credit default swap] transactions.’ He was almost right – he was off target by just $183 billion, the amount the US government ended up spending on AIG’s bailout. It’s the same in Europe. Greece has missed 210 of 300 economic targets given it during the course of its extended bailout misery. More recently, the Spanish government of Mariano Rajoy promised financial markets that it would meet its deficit targets and that a bailout was out of the question… until of course it missed those targets and the only bailout question remaining is how many hundreds of billions of euros are required. It was much the same thing in Ireland and Portugal. It will be much the same in Italy too. So let’s set intentions and promises to one side and look at the facts. First of all, it’s clear that RBS is not about to return to the private sector. The company has just made a six-monthly loss of £1.5 billion. Its computer systems are clearly dysfunctional. It seems certain to get hit with major fines for its role in the LIBOR fixing scandal. The bank’s core business of lending to British companies is gummed up and directionless. The bank’s size makes proper management difficult and restricts competition both on the high street and in business lending. And if private ownership remains a pipe-dream, the current arrangement seems like the worst of all worlds. The principal shareholders (you and me) can’t take effective operating decisions because of the private minority. Meanwhile the entire country suffers from a failing banking system. So nationalisation is the first part of the answer – and Vince Cable is brave and right to suggest it. But nationalisation is only the first step of a long and difficult journey. The next step – the tough one – involves utter honesty about the balance sheet. European sovereign bonds need to be valued at their actual market value. That’ll imply huge losses. Loans backed by British real estate also need to be fiercely written down. Outside a developing property bubble in London and surrounding areas, UK property prices are nosing down. That’s not surprising. In a world where real wages are decreasing, and after a decade long property bubble, prices have nowhere to go but down. That means RBS’s property book is softer than a baby’s bottom. 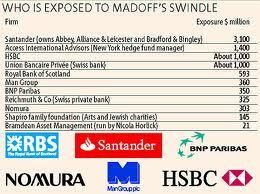 Hey Vince Cable, should Madoff value RBS Assets? My own suspicion is that if RBS’s assets were properly valued, it would not be solvent. (I don’t think RBS is alone there, by the way. I think most European banks are insolvent: a belief that others, including the head of Deutsche Bank, share with me.) The traditional government response to financial distress is to pour your money into the stricken institution. It’s what Gordon Brown did like crazy in 2008-09. It’s what countless other governments did too. But that’s good. Those losses are good. They’re good for two reasons. One, if creditors make bad loans, they need a reminder to do their due diligence. That’s the only way to avoid the same mistakes in the future. Secondly, as creditors take their losses, RBS can emerge from the ashes with a strong balance sheet, and a sense of confidence. It can start to invest again: in computer systems, in business lending, in all that bread and butter stuff that the firm has neglected so long. Bankruptcy would help for a third reason too. RBS is too big, too bloated. It needs to be broken up into smaller, nimbler firms that can reintroduce competition to our dysfunctional industry. That can’t be done with a firm that’s already struggling for financial solvency. It needs to be done on the back of a new, strong balance sheet. And it needs to be done without taxpayers contributing a single penny more to the process. We’ve done enough already. It’s time for a new start. It’s over to you, Vince. One Responses to Nationalise the beleaguered RBS? Or Let them fail, you decide… Its your money! Thank you for an excellent article, many believe Europe (little old England included) is overdue for a correction. Time will tell.